Anupama Dokeniya  indicates that the translation of the data and transparency revolutions called for in  may be fraught with challenges. We address such challenges in an approach along the lines of the Collaborative Planning Methodology (CPM) of the US Federal Enterprise Architecture Framework (FEAF). Both serve as a source of ideas and practices for an effective partnership architecture. 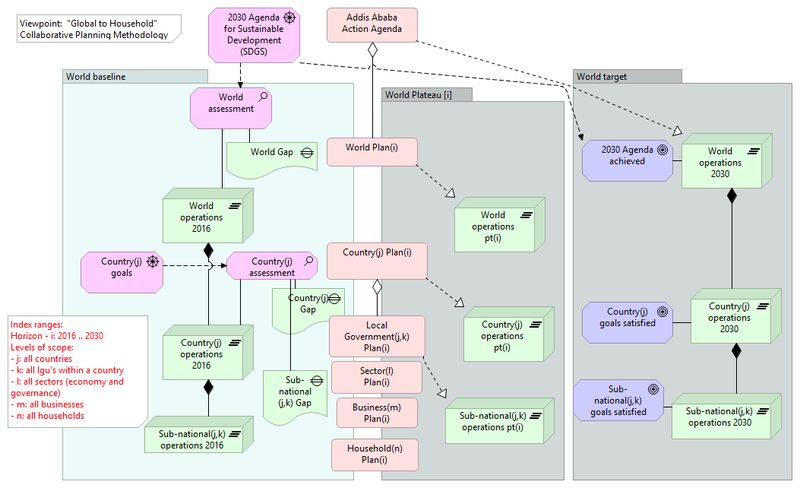 The figure below uses concepts from FEAF and CPM, and modelling elements from ArchiMate. Definitions and further links can be found in the Techno order chapter of the Ens Dictionary. Given the draft sustainable development goals and targets1, the addressing of gaps can be framed under SDG17: Strengthen the means of implementation and revitalize the global partnership for sustainable development. Specifically for the follow-up and review (as addressed in Addis Ababa Action Agenda - III. Data, monitoring and follow-up the target that matters is: SDT1719: by 2030, build on existing initiatives to develop measurements of progress on sustainable development that complement GDP, and support statistical capacity building in developing countries. Private sector will be a key partner to bring sustainability to scale. proposes a number "principles for private sector journeys". How the private sector is embracing the digital transformation can serve as a further source of ideas . - Catalyzing the Next Generation of Multi-Stakeholder Collaboration for Sustainability (February 2016, url). 1. Read and comment on each of them at Sustainable Development Goals and Targets (part of the Actor Atlas).